Dubai, UAE, July 24, 2018: Ladies, what if we told you that achieving a flawless, perfect skin is as easy, if not easier, than choosing a filter for your Instagram photos? Sounds too good to be true? Try our four star products and we guarantee you there will be no looking back! Start off with the essence fresh & fit awake primer, this ultra-smooth texture with Vitamin B3, E and B5 minimises pores and lends an instant healthy glow. 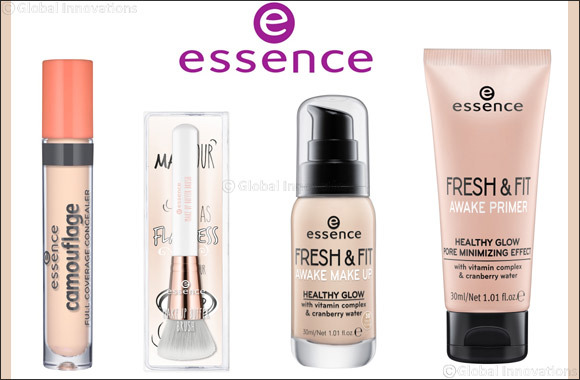 Then, dab on essence fresh & fit awake make-up foundation, enriched with vitamin complex and cranberry water, to “wake-up” the skin and give it a healthy look. The foundation’s delicate light reflecting pigments ensure a smooth complexion with a fresh touch. A little goes a long way, one to two pumps of this breathable texture offers a flawless medium to high coverage. Use the foundation with our favourite essence make-up buffer brush. Dab the foundation and gently work the texture into the skin for a flawless look. The flat surface of the brush is perfect for creamy or liquid textures, and works like a dream with bronzer, blush or even your day cream. Next, dot and blend our essence camouflage full coverage concealer under your eyes and around your nose and mouth to conceal any uneven tones. This long-lasting and highly pigmented, liquid-creamy texture reliably covers-up all skin irregularities for a natural, wide-awake look. Finally, finish off with our popular all about matt! fixing compact waterproof powder for an extremely smooth and natural finish all day long. This transparent powder works on all skin tones and ensures that your make-up does not budge. It is no wonder then that all about matt! is our go to companion on humid days. C’est tout! That was easy, wasn’t it? Follow these steps and you are guaranteed a gorgeous flawless skin this summer.